ReichmannHauer Capital Partners (RHCP) is a private investment firm of active investors and business builders. Our principal orientation is to be highly active, yet patient owners, driving lasting strategic and operational improvements and strong financial returns. RHCP proactively seeks unique investment opportunities that match one or more of our proprietary value creation themes. Following an intensive due diligence process, we seek to acquire control or significant influence over target businesses. This proprietary diligence process always involves building a value creation blueprint for the company, which outlines how we expect to grow its value over a 3-5 year horizon. Following the closing of a transaction, our team continues the process of co-creating a more detailed version of the blueprint with management, including a granular 100 day plan to set investee organizations on faster and more profitable trajectories. We begin executing these plans immediately after our transactions are closed, and where possible, before closing. Over the life of an investment, RHCP’s notion of “active ownership” goes far beyond just participating in Board and management meetings or planning major corporate decisions. 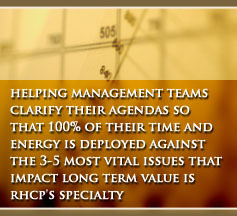 RHCP acts as a full value creation partner, assisting teams with more granular management challenges. Some of these challenges include reviewing and implementing strategy, budgeting processes, and optimizing sales coverage models and incentives. Philosophically, RHCP was founded on the idea of “winning together”. We believe in the power and importance of the right incentives. We have designed our firm, both in the relationships between our own people and in the relationships we have with investee organizations, so that each of us has clear and strong incentives to pursue the same goals.